A new patient came to my office for a cosmetic consultation last May (2010). She was looking for just the right dentist. And, she had been doing a LOT of research online. She was visiting the websites of just about every “cosmetic” dentist in southeast Florida. And, there are a LOT of them. I asked “Lilly” why she chose to see me (besides my rugged good looks). She told me she didn’t want a carbon-copy Hollywood smile. “They all look the same!” She wanted one that was custom made just for her. And, not only did all the smiles on the other websites look the same to her… A lot of the “before & after” cases she saw were the SAME PEOPLE on different dentists’ websites. In other words, she realized she was looking at mostly stock photos (rather than the dentists’ own cases). Lilly knew exactly what she wanted. I mean she REALLY knew. You won’t believe this, but I swear it’s true. She took photos of her own smile and then photoshopped them to show me what she wanted. And, she did a heckuva job! No kidding… really good. I’ll see about getting her to email them to me so I can post them in this post later. But, what really sold her on my practice was one particular case she saw on my website that was very much like her own situation. So, the first lesson here is the importance of shooting your own photos of your own work. Having photos of your own cases on your website (and other marketing efforts) is MARKETING GOLD. Get rid of the stock photos! Taking up clinical and portrait photography is one of the best things I’ve ever done for my practice. In my opinion, it’s mandatory. I’ll be blogging about that specific subject in the future. 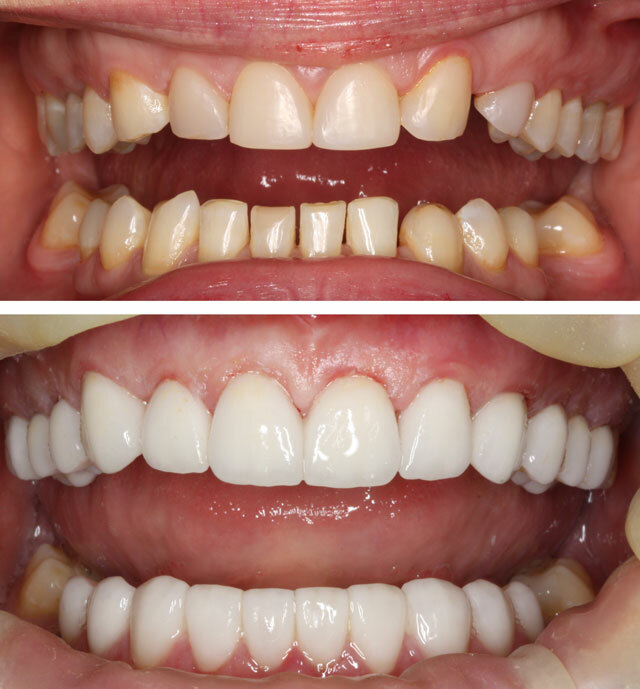 So, in Monday’s blog post, I showed you a quick before and after shot of a very grateful Six Month Smiles (short term ortho) patient. He said it was the best day in his life. Today, I delivered the upper porcelain (12 units) for Lilly. And, she is SO HAPPY! Makes for a good week when you have patients that are jumping for joy over their new smiles. Cases like this take a lot of planning. From start to finish, treatment took 8 months. Lilly had a congenitally missing #10 with #11 in its place. Her upper left deciduous was retained but on its last legs. It was extracted and replaced with an implant. I think the final result (making #11 look like a lateral incisor) is pretty good! Mind you, the photo was taken immediately after bonding them in. I’ll post a more complete case presentation when I follow up with Lilly and take final case photos. The “after” photo was taken today immediately after delivery. More to come! Today’s delivery of 12 units of porcelain (#3 – 14). Love the surface texture and incisal anatomy! Lowers can use a little recontouring. Today’s well-equipped Dental Warrior has an effective website that includes Before & After photos of actual cases. Get a camera and start shooting! UPDATE: Click here to see the “glamor shoot” photo session with this patient. This entry was posted in Photography, What Happened Today and tagged dentist website, website marketing. before & after. Bookmark the permalink.